Reading and share top 6 famous quotes and sayings about Bias Prejudice by famous authors and people. Browse top 6 famous quotes and sayings about Bias Prejudice by most favorite authors. 1. "By calling into question the very ideal of a universal, autonomous reason (which was, in the Enlightenment, the basis for rejecting religious thought) and further demonstrating that all knowledge is grounded in narrative or myth, Lyotard relativizes (secular) philosophy's claim to autonomy and so grants the legitimacy of a philosophy that grounds itself in Christian faith. 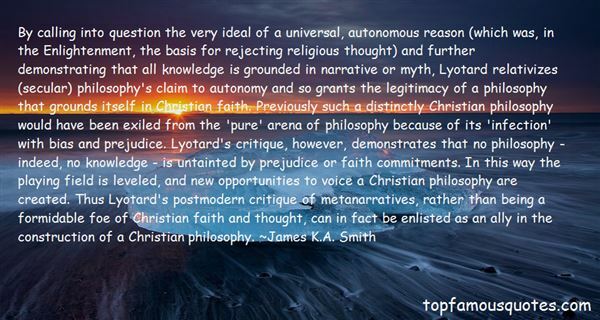 Previously such a distinctly Christian philosophy would have been exiled from the 'pure' arena of philosophy because of its 'infection' with bias and prejudice. Lyotard's critique, however, demonstrates that no philosophy - indeed, no knowledge - is untainted by prejudice or faith commitments. In this way the playing field is leveled, and new opportunities to voice a Christian philosophy are created. Thus Lyotard's postmodern critique of metanarratives, rather than being a formidable foe of Christian faith and thought, can in fact be enlisted as an ally in the construction of a Christian philosophy." 2. "I think, as written, 'Assassins' simply acknowledges the very human need to be acknowledged. As director, I've got to put aside any particular biases or prejudices that, as a moral human being, this is not an appropriate or acceptable way to get what you want." 3. "They began by controlling books of cartoons and then detective books and, of course, films, one way or another, one group or another, political bias, religious prejudice, union pressure; there was always a minority afraid of something, and a great majority afraid of the dark, afraid of the future, afraid of the past, afraid of the present, afraid of themselves and shadows of themselves." 4. "Any of you would go around the world for the sealing ordinance if you knew its importance, if you realized how great it is. No distance, no shortage of funds, no situation would ever keep you from being married in the holy temple of the Lord.There is no bias nor prejudice in this doctrine. It is a matter of following a certain program to reach a definite goal. If you fail in following a program, you fail in attaining the goal. Even in college work, if you never registered properly, never attended your classes, never did the things which are required by the college, you would never receive your degree. Certainly you cannot expect the eternal program to be less exacting." 5. 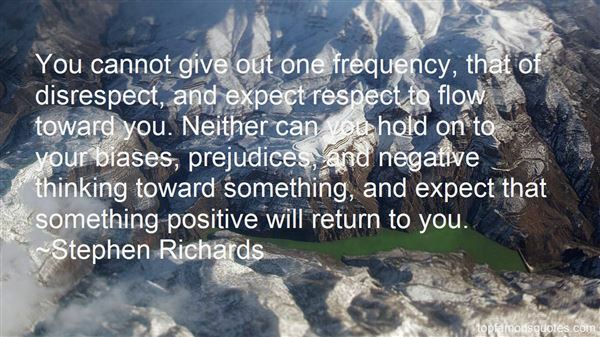 "You cannot give out one frequency, that of disrespect, and expect respect to flow toward you. Neither can you hold on to your biases, prejudices, and negative thinking toward something, and expect that something positive will return to you." 6. "A famous bon mot asserts that opinions are like arse-holes, in that everyone has one. 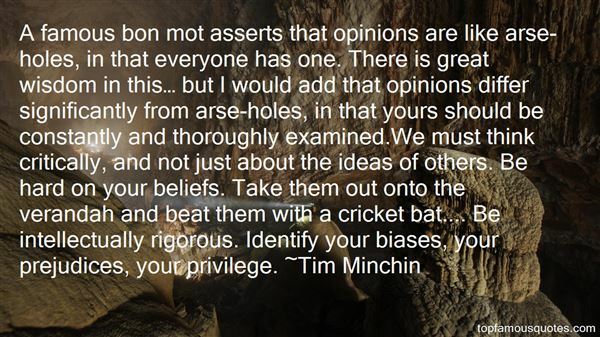 There is great wisdom in this… but I would add that opinions differ significantly from arse-holes, in that yours should be constantly and thoroughly examined.We must think critically, and not just about the ideas of others. Be hard on your beliefs. Take them out onto the verandah and beat them with a cricket bat.... Be intellectually rigorous. Identify your biases, your prejudices, your privilege." It gets tiring, doing the same thing everyday."